Take a walk on the spooky side. The rustle of dead leaves. The pop of a snapping twig. As the sun sinks behind the hills and shadows grow long, these are the sounds that raise goosebumps and stir the imagination. In the cold, crisp air of autumn, the many spooky legends of the Maine woods come out to play, creeping into the minds of hikers, bikers and fishermen alike. It’s a season of short days and frosty nights. The bright foliage fades and falls and decays. And on the skeletal branches left behind, crows gather and roost. They caw and clack, their dark eyes shining. Following blazes of red paint on a public trail, a woman descends the wooded hill, over twisted tree roots and loose rocks, to the edge of Silver Lake. Like many other visitors to the Bucksport trail network, she is drawn to the shore. Gray waves lap at her feet and a cold wind tangles her hair. In the gloom of a cloudy afternoon, her figure appears to cast its own faint light, wavering, ethereal. Then she’s gone. A local trail network that offers approximately 2 miles of woods walking, Silver Lake Trails in Bucksport lies within a 67-acre park on Silver Lake, which is said to be haunted by the headless ghost of a woman named Sarah Ware. Born in 1846, Sarah Ware of Bucksport disappeared in September of 1898, and during a town-wide search, her body was discovered in the pastures of the home where she’d been employed as a maid. Right away, the scene suggested foul play. Ware’s skull was badly damaged, and when local men lifted her body to place it in a coffin, her head fell off, according to the book “In Search of Sarah Ware: Reinvestigating Murder and Conspiracy in a Maine Village” by Eric Spooner, an assistant librarian at the Buck Memorial Library who in 2006 began digging up records about the murder in old newspaper clippings and court documents. The crime was never solved, and Ware’s body was buried at the old Silver Lake Cemetery. Her head, however, was held in the Ellsworth Courthouse as evidence, according to the book. In 1930, all of the graves of the cemetery were relocated when a dam was built and Silver Lake expanded over the site. Ware was moved to Oak Hill Cemetery off McDonald Street, where her headstone sits at the woodland edge beside those of her family. And in 1998, her head was reunited with her body. Or was it? Some versions of the story claim her headless body was never relocated and that she is still buried below Silver Lake, which would certainly explain her haunting the lake and nearby woods. For more information about these haunted trails, visit www.bucksportmaine.gov and search “Silver Lake Trails” or call the Bucksport Town Office at 207-469-7368. How to get there: From Main Street in Bucksport, turn onto Central Street (beside MacLeod’s Restaurant and across from Fort Knox Park Inn). Follow Central Street approximately 1.8 miles and turn left into the parking area of Bucksport Public Works (362 Central Street). Follow signs for Silver Lake Trails to the left of the blue buildings and down a dirt drive to the parking area for the trail network. A kiosk with a trail map marks the trailhead. One of the most popular hiking destinations of Midcoast Maine, Maiden Cliff rises 800 feet above Megunticook Lake on the dramatic western slope of Megunticook Mountain. A 1-mile trail leads to the top of these cliffs, which offer spectacular views of the lake and nearby hills — but exercise caution while near the ledges. In the mid-1800s, a young girl fell to her death from the top of Maiden Cliff, and some believe her spirit lingers at the scenic spot. A giant, white-painted steel cross and memorial plaque located atop the cliffs tells the story. On May 7, 1864, 12-year-old Elenora French, a farmer’s daughter, was attending a maying party that hiked up the mountain to the outlook atop the cliffs, and according to local legend, Elenora fell while trying to catch her windblown hat. The Maiden Cliffs Trail starts out as a gradual climb, following a brook for the first 0.5 mile. This part of the trail offers some beautiful woodland scenery of tall evergreens, boulders and twisted roots. At about 0.5 mile, you come to a trail juncture where you turn left to continue on Maiden Cliff Trail. From there, the trail becomes increasingly steep and rocky before leveling off into a smooth path that leads to the viewpoint and memorial cross and plaque. For more information, visit maine.gov/camdenhills or call Camden Hills State Park at 207-236-3109. How to get there: From the intersection of Route 1 and Route 52 in Camden, turn onto Route 52 and travel north for about 2.8 miles. The parking area for Maiden Cliff Trail will be on the right. The legend has many versions, one of which is recorded in “A Ghost a Day: 365 True Tales of the Spectral, Supernatural and … Just Plain Scary!” by Maureen Wood and Ron Kolek. Their version of the legend states that motorists driving between the town of Franklin and Cherryfield on Blackwoods Road often see a ghostly spectre of a headless woman named Catherine. The story goes that Catherine and her boyfriend were driving back from prom on Feb. 17, 1974, when they lost control of their car and crashed into the woods. Catherine was beheaded in the accident and died immediately, but her boyfriend’s body was never found. Some say that her ghost is looking for him. Beside the road, she haunts the banks of Fox Pond and Catherine Mountain. Regardless of the reason she’s there, authors and tellers of the legend insist that if motorists see the headless ghost, they must stop to pick her up or meet a disastrous fate. Other versions of the legend place Catherine’s death as early as the 1860s (a carriage accident) and specify that her ghost wears a long blue gown. Other stories insist her gown is white. Starting at the gravel Dynamite Brook Road, the hike up the west side of Catherine Mountain climbs gradually through a forest of tall evergreens, and like many mountain trails, it becomes steeper as it nears the top. Marked with blue blazes and rock piles (called cairns), the trail visits several open rocky areas and ledges that offer open views of the region. Near the summit of the mountain is a pile of sharp, broken stone piled up in the rough shape of a chair. Perhaps it’s a throne for Catherine? After this structure, the trail explores a ledge and heads down the east side of the mountain to end at Blackwoods Road. How to get there: From the intersection of Route 1 and Route 182 in Franklin, turn east on Route 182 (Blackwoods Scenic Byway) and turn right onto Dynamite Brook Road, a dirt road marked with a blue public reserved land sign. Drive a short distance and park in the first small parking area on the left. The parking area is marked with a brown public reserved land sign and a smaller sign pointing to the trailhead, which is farther down the road on the left, just before the narrow bridge. The trailhead is marked by a boulder painted with a blue blaze. 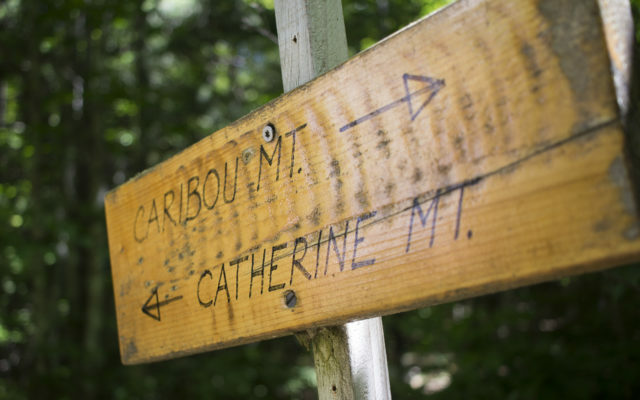 Not far from the trailhead you’ll reach an intersection where you turn left to hike Catherine Mountain or right to hike Caribou Mountain.